Having a baby is an experience that really brings you full circle in so many ways. When they laid Piper on my belly for the first time and she looked up at me, I will never forget that moment. It’s a moment burned in my memory forever. It makes me smile – it makes me tingly inside. It’s a WOW moment. Another thing I remember thinking in those precious moments after the delivery was I FINALLY understood a mother’s love. I realized that was exactly how my mom looked at me. She had that same moment…but it was me she was looking at…and I feel so lucky that I got her. 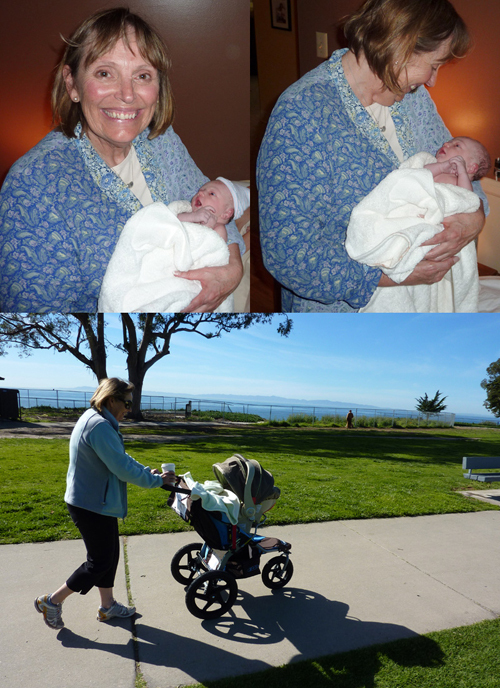 As my mom held Piper for the first time right after the delivery – I stared in amazement. I FINALLY understood how much my mom loved me. My mom left yesterday morning at 5 a.m. to head back to Colorado with my dad. She said she wouldn’t be able to say goodbye…it would be too hard. So, she packed her bags the night before and when 5 a.m. came, they were out the door. She brought Piper Jane into me one last time before she left and I couldn’t hold back the tears. But, I knew deep down she was leaving because she loved me – I mean, she couldn’t stay FOREVER. Plus, I know she has the utmost confidence in me as a mother and I know she just wants the world for Mark, Piper and I. My mom was there before the delivery, she held my hand through it and she stayed for 2 weeks after to help with Piper, cook, clean – and do whatever it is that mom’s do. She is always busy. She is a master list-maker. Whenever there is a spare moment she’ll exclaim, “Let’s make a LIST!” It’s her favorite thing to do…and her next favorite thing is to try and get everything crossed off. It’s a constant cycle. We’ve made so many lists together, I could make a never-ending list of all the lists we’ve made. One of the biggest fears I had of her leaving, was I was going to have to put into words how grateful I was for everything that she had done for us…and that was going to be hard…almost next to impossible. There just aren’t words that will ever come close to the gratitude that I feel. So, I thought about Piper and how I would want her to thank me and I thought, hmmm…all I ever truly want is for her to know how much I love her. So, there. I did it. Mom, I know how much you love me…and I feel so lucky that I got you. Thank you. Thank you for being my best friend, for loving me, for making me a better person and most importantly, a better mother.